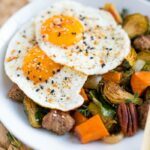 A sweet and savory hash recipe made with roasted veggies, sautéed spinach, breakfast sausage and eggs. 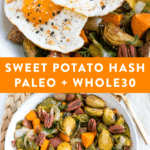 Paleo, gluten-free and Whole30 approved. Back in December, Isaac and I escaped to Austin for a little weekend getaway. I’ve been there before a couple times, most recently for my best friend’s bachelorette party, but I was excited to go back with Isaac to explore even more! One of my “must stop” places was Picnik . . . which is basically a healthy food lovers dream. 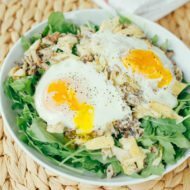 I ordered the Harvest Hash – a delicious combination of veggies, sausage, maple vinaigrette and an egg – and I have basically been dreaming of it ever since, so knew I had to try to recreate it at home! 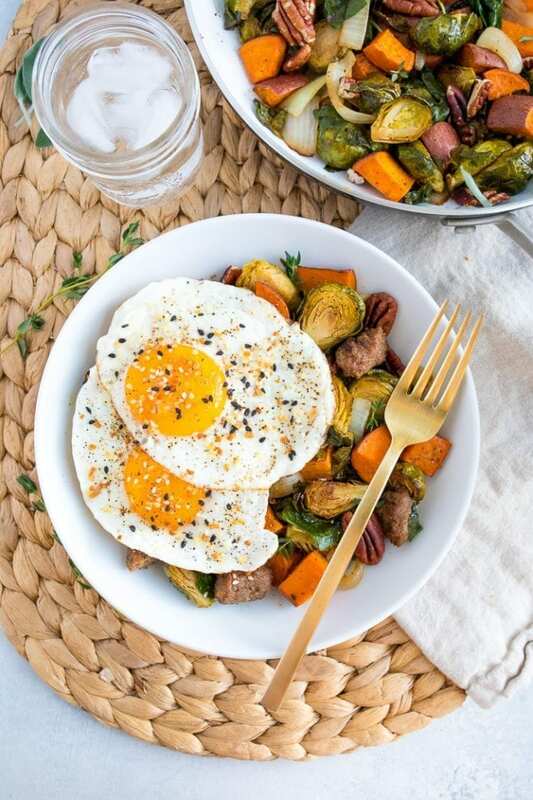 This hash is so well-rounded with roasted veggies, greens, eggs for protein and a delicious “sauce.” We’ve been eating it for breakfasts, dinners and everything in between. It also happens to be paleo and Whole30 approved. If you’ve been following me for a while, you know I don’t follow either of those diets specifically, but I do think they’re a great way to get a ton of veggies and other whole foods into your life. Now I’m curious . 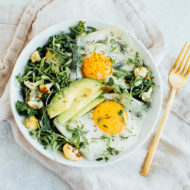 . . how many of you are doing Whole30 or following a Paleo lifestyle?! I strategically created this hash so each component would have a unique texture. There is nothing worse than making a “hash” and having it end up being a big mushy scramble. And that’s definitely not the case with this one. It has lots of textures going on. While your veggies are roasting away, you’re going to prep a few things on the stove top. Start by toasting pecans in a dry saucepan. If you’ve never toasted nuts before, don’t be nervous! Just pay attention to them (they can burn easily), stir occasionally and remove from the heat when they smell toasty (official term) and are golden brown in color. In that same skillet, add your oil and sauté the onion and garlic. After your onion is translucent (aka cooked through), add the spinach, balsamic vinegar, and maple syrup and heat until spinach is wilted. 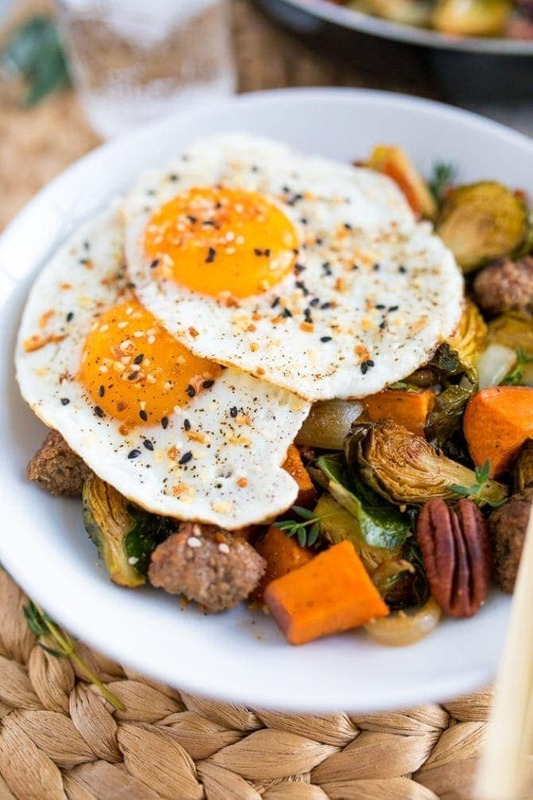 When all of your veggies are ready, you’ll toss everything together and then cover to keep warm while you fry up your eggs. And voila – you have a delicious, filling hash. 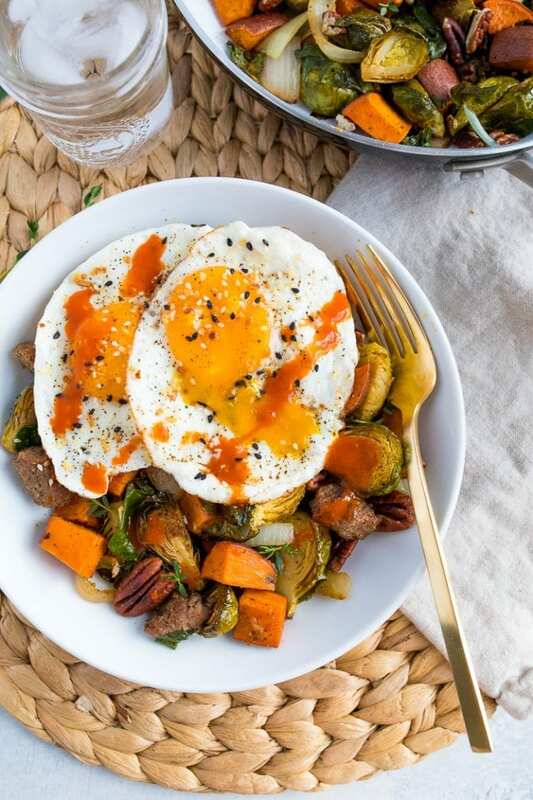 If you make this roasted sweet potato hash, please be sure to leave a comment and star rating below. Your feedback is super helpful for the EBF team and other readers who are thinking about making the recipe. 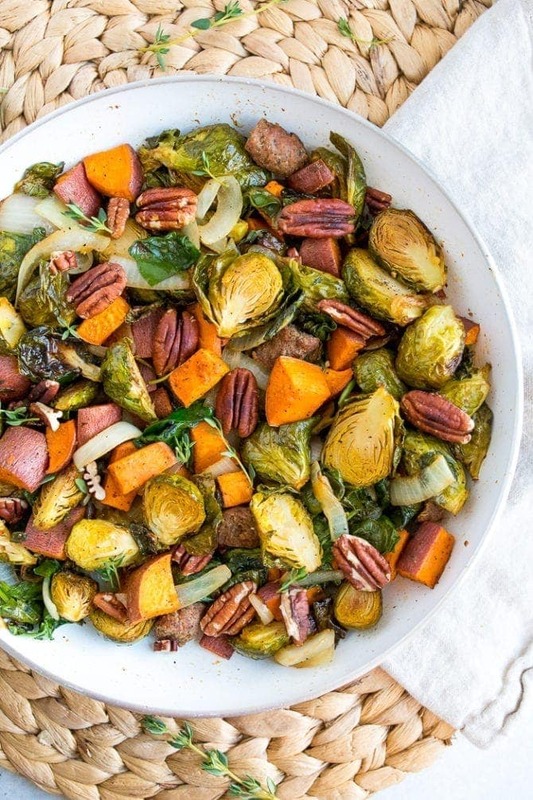 Toss chopped sweet potatoes and brussels sprouts in 1 1/2 Tablespoons of oil, with 1/2 teaspoon salt, 1/4 teaspoon paprika and 1/4 teaspoon pepper. Spread veggies onto a large baking sheet and roast for 30-40 minutes. Around the 25 minute mark, remove pan from oven, toss veggies and add frozen sausage links (if using) to the sheet pan. Continue roasting until sweet potatoes and sprouts are fork tender and sausage is warm throughout. Meanwhile, toast pecans in a large, dry skillet for 1 to 2 minutes or until they’re golden brown. Watch closely because they can burn quickly. Remove from heat, let cool and then roughly chop. Using the same large skillet, add 2 teaspoons oil over medium-high heat. Once oil is hot, add onions and garlic. Toss to combine and season with a little sea salt and pepper. Cook until onions are translucent and fragrant, about 5-6 minutes. Add baby spinach, balsamic vinegar and maple syrup and toss to combine. Cook for 1-2 minutes or until spinach has wilted. Remove from heat and cover to keep warm until the veggies are done roasting. 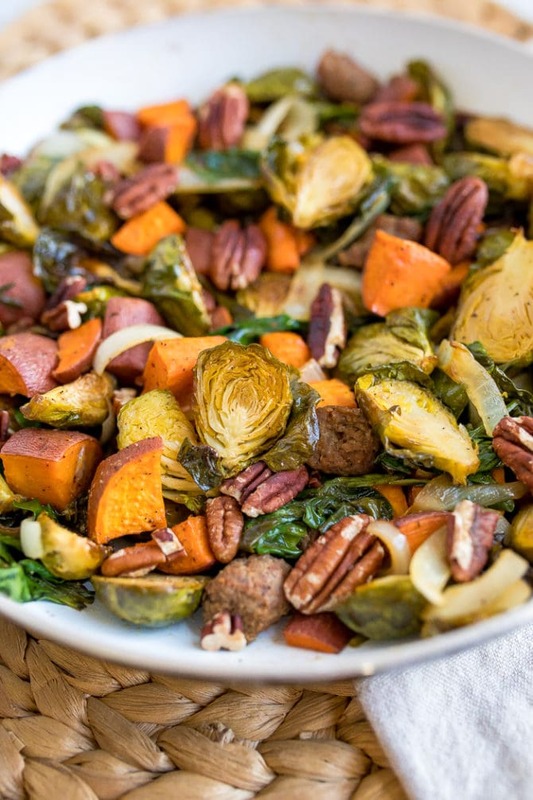 Once sweet potatoes, brussels sprouts and sausage are done roasting, transfer them to the skillet with the onion and spinach mixture, add the pecans and toss everything to combine, using your spatula to break the sausage links into smaller pieces. Cover to keep warm while you cook your eggs to serve over the hash. You can pan-fry or poach the eggs, whichever you prefer. 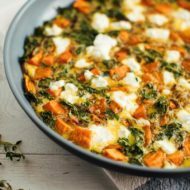 To serve, place sweet potato hash mixture onto a plate and top with 2 cooked eggs. Garnish with fresh thyme (if using) and top with hot sauce, if desired. To save time, you can prep the roasted veggies and the onion and spinach mixture 1-2 days in advance. Reheat on the stovetop while preparing your eggs when you’re ready to serve.